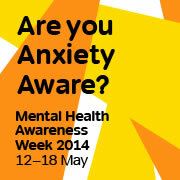 This week is Mental Health Awareness Week (12-18 May 2014) and the focus is on Anxiety. According to figures from the Mental Health Foundation 1 in 5 people feel anxious a lot or all of the time. Anxiety disorders affect roughly one in 20 adults in Britain. Everyone has feelings of anxiety at some point in their lives, it is normal to experience anxiety in everyday situations. However persistent and excessive anxiety can cause more serious mental health problems. Anxiety is one of the most common mental health problems in nearly every country in the world and, while a low level of anxiety can be a useful motivating force, in some cases it can take over your life. A recent article on the BBC website highlighted how people feel “awkward” around people with disabilities. In a survey by the disability charity Scope, two out of three people feel uncomfortable talking to a disabled person. For our learners this anxiety is often a factor in their isolation. Using the internet, blogging, social media and chat rooms allows them to communicate with other people minus this awkwardness. It also offers a chance to talk to other people with disabilities and share experiences.